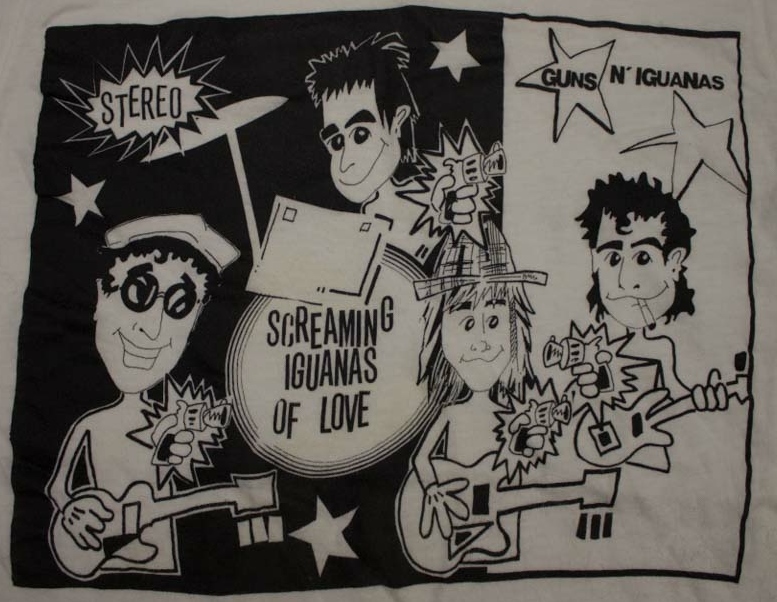 A t-shirt for the band Screaming Iguanas of Love. Formed in Melbourne, Florida, in early 1987, the group consisted of singer, songwriter, and guitarist Gregory Reinel; drummer and background vocalist David Burley; and bassist and background vocalist J. T. Burley. Although their sound has been described as retro and akin to many of the British invasion bands of the mid-1960s, such as the Beatles, the Rolling Stones, the Kinks, and the Dave Clark Five, the band recorded their two albums on Naked Language, Ichiban Records' alternative-rock division, capitalizing on the popularity of the alternative rock movement of the early 1990s. Their sound is also heavily influenced by rockabilly. 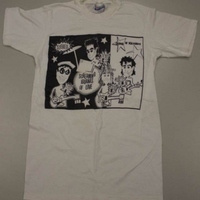 The artwork on this t-shirt is reminiscent of their first album, Wild Wild Wild, which was released in 1991. Their second and final album, Glad You Weren't There, was released in 1992. Although neither album was widely distributed, both were critically well-received. The band backed Roy Loney of Flamin' Groovie in a short series of Southeastern dates and also toured with the Fleshtones. Original color digital images: Private Collection of Mick Dolan. Digital reproduction of original color digital images. Rock Collection, Central Florida Music History Collection, RICHES of Central Florida. Copyright to this resource is held by Screaming Iguanas of Love and is provided here by RICHES of Central Florida for educational purposes only. Gettelman, Parry. "Big Break For Iguanas." The Orlando Sentinel, October 16, 1991. http://articles.orlandosentinel.com/1991-10-16/lifestyle/9110150288_1_iguanas-greenlee-wild-wild-wild. Gettelman, Parry. "Screaming Iguanas Of Love." The Orlando Sentinel, November 15, 1991. http://articles.orlandosentinel.com/1991-11-15/entertainment/9111130347_1_iguanas-wild-wild-wild-ichiban-records. Gettelman, Parry. "Iguanas' 'Glad' Already On The Airways." The Orlando Sentinel, July 24, 1992. http://articles.orlandosentinel.com/1992-07-24/entertainment/9207220209_1_iguanas-reinel-wild-wild-wild. Gettelman, Parry. "Screaming Iguanas Of Love." 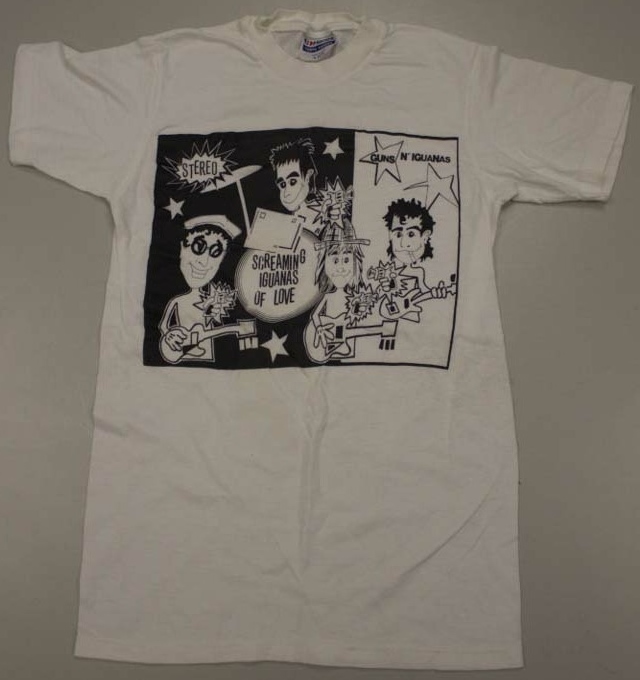 The Orlando Sentinel, September 4, 1992. http://articles.orlandosentinel.com/1992-09-04/entertainment/9209020923_1_iguanas-fireproof-guitar. Gettelman, Parry. "Deep Blues and Alternative Iguanas. Orlando: In the Shadow of ‘Tourist World,’ Real Music Breaks on Through." Billboard (March 6, 1993): 55-57. 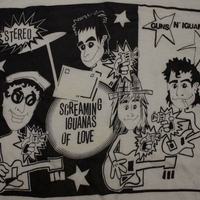 “Screaming Iguanas of Love T-Shirt.” RICHES of Central Florida accessed April 20, 2019, https://richesmi.cah.ucf.edu/omeka/items/show/6215.